Emergency services were called after the alarm was raised at around 3pm this afternoon. Coastguard helicopter: Rushed to the scene. Five rowers have been rescued after their boat capsized on a river. The alarm was raised at around 2.50pm on Saturday after the boat overturned on the River Dee, the coastguard said. The five rowers managed to climb on top of the boat and were rescued by the pilot boat from Aberdeen Harbour which went to the scene. 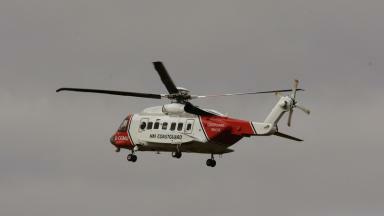 Aberdeen RNLI lifeboat and coastguard rescue team and an offshore industry rescue helicopter also went to help. The pilot boat took the rowers to the lifeboat boathouse where they were checked over by the paramedic from the helicopter and ambulance crew. They were all found to be well.